A jaunt along Rustic Road 58, one of three such state-certified routes in the area, meanders through hardwood and fragrant pine forests, crosses two burbling creeks, one with two beaver lodges, then rolls through cedar lowlands. Rustic Road 60, north of Arbor Vitae, winds through a slice of the Northern Highland - American Legion State Forest, where you&apos;re bound to spot a plethora of wildlife, plus leads you past the Minocqua area&apos;s numerous sparkling, blue lakes. In the fall, capture the breathtaking beauty of the bright reds, vivid yellows and warm oranges reflecting off the sparkling water of area lakes, arching over our three local state-certified rustic roads or along the hundreds of miles of hiking and biking trails. Generally, peak colors can be seen between the last two weeks of September to the first two weeks of October. Make plans to stay in the area while visiting the local Colorama celebrations, and you will be sure to experience the glory of the Northwoods in fall. 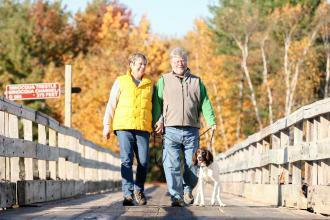 Stop by the chamber for information about fall color tours, as well as trail and area maps. With approximately 9.6 miles of paved roadway, R-58 skirts many scenic Northwood’s lakes as it winds through scenic pine and hardwood forests. 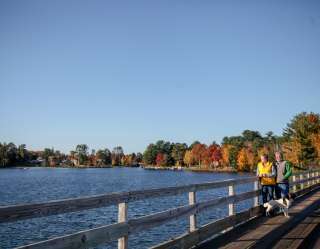 This route also crosses a railroad bed that was used in the 1800&apos;s as a mainline to Minocqua, which has now been converted to the Bearskin State Trail for hiking and biking. Where Blue Lake Road intersects the Tomahawk River, you&apos;ll find an ideal spot to launch a canoe or kayak. The Northwood&apos;s beauty continues along Mercer Lake Road as it travels across two small creeks (one of which is home to two beaver lodges) and through cedar lowlands before intersecting with Hwy. 70. Directions: Travel north on U.S. Hwy 51, just past Hazelhurst, and turn west onto Blue Lake Road. Blue Lake Road will turn into Mercer Lake Road, which will travel north to intersect Hwy. 70. With a narrow gravel road bed that is much less traveled than Blue Lake Road, R-59 offers frequent glimpses of native wildlife, hidden flashes of early homesteading cabins and great views of shady, tall pines and colorful hardwoods. This trip is approximately 4.5 miles long. Directions: Travel north on U.S. Hwy. 51, just past Hazelhurst. Turn west onto Blue Lake Road. Turn north onto Sutton Road (gravel). Sutton turns into Camp Pinemere Road, which intersects Hwy 70. This winding route travels through the Northern Highland - American Legion State Forest. Canopies of coniferous and hardwood trees enhance the scenic beauty of R-60 as it passes near old logging camp sites, hiking trails and an old saw mill located in Star Lake. The entire stretch of this scenic drive traverses heavily wooded areas abundant with wildlife. 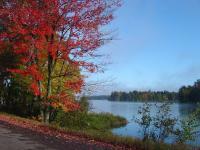 R-60 offers frequent scenic vistas of numerous, clear Northwoods lakes and dense forestland. Directions: Travel north on U.S. Hwy. 51, past Woodruff to County Road N. Travel east on County Road N to County Road K (Star Lake). This tour is approximately 13 miles long. Begin at Chamber Office and head north on Highway 51 to Highway 70 West turn left at stoplight and head down Hwy 70 West approximately 5 miles. Tour begins at highway 70 West at junction of MINCH Drive west and KILAWEE Road (approx. 5 miles west of Hwy. 51). Go south on KILAWEE Rd. Stay on black top. Road swings left. Follow arrows. Winding road. STOP SIGN. MERCER LAKE Road. Turn right (south). Stay on black top. Cross creek from Mercer Lake. Watch for deer. Junction with BLUE LAKE Road & SCOTCHMAN’S LAKE Road. Turn left (East) on BLUE Rd. Keep on black top. Cross Tomahawk River. Keep on black top. Turn right on CAMP NINE Rd. (South). Stay on CAMP NINE Rd. Junction with LOWER KAUBASHINE Road and CEDAR FALLS Drive. Follow arrows because metal highway sign is twisted. Turn sharp left (east) on LOWER KAUBASHINE Road. Junction CEDAR FALLS Road. Turn Half left (½ Left) and cross both railroad tracks. Junction with US 51. Stop. Turn left for return to Minocqua. Turn right (south) for Tomahawk. This tour is approximately 18 miles long. Begin at Chamber Office and head north on Highway 51 to Highway 70 West turn left. Head down Highway 70 West approximately 5 miles. Tour begins at Highway 70 west at junction of MINCH Drive, west and KILAWEE Road (approx. 5 miles west of Hwy 51). Go West on Hwy 70. SQUIRREL LAKE Road. (Look for Minocqua Winter Park sign) Turn Left. Stay on black top. This is a winding road with abrupt hills and sudden valleys so stay on your own side of the road. Watch for on-coming cars. Stay on SQUIRREL LAKE Road. Avoid side roads even if black top. Rock on left. Legend on it says SET BY PAUL BUNYAN & BLUE OX BABE. Franklin Lake. Stay on SQUIRREL LAKE Road. Turn right on BO-DI-LAC Road (on right after Minocqua Winter Park). It is black top and winding. Note creek from Pine Lake. See tall Norway pines. Diamond Lake on left. Follow shores of Diamond Lake. Bo-Di-Lac Fire Department #1 (small building colored white and red) and BO-DI-LAC Drive. Turn left at Fire Department house. Keep left on BO-DI-LAC Drive. Booth Lake on right. Buckskin Lake on left. This tour is approximately 15 miles. Wooded residential section. Keep right on COUNTRY CLUB Road past BRINKLAND. NARROWS Road, keep left. Stay on COUNTRY CLUB Road. At Y in road stay to the right onto THOROUGHFARE Road. Road swings to left. Avoid Dead End road. Cross bridge on THOROUGHFARE between Minocqua Lake and Tomahawk Lake. Fork in road. Keep left onto MIDLAKE Road. Sign Deer Crossing. STOP. Hwy 47. Turn left. Go NW on 47 only short distance. Clear Lake Campground sign and WOODRUFF Road. Turn right. Keep on black top WOODRUFF Road past Woodruff-ArborVitae School Forest (Black and red sign). CLEAR LAKE CAMPGROUND Road. Stay on WOODRUFF Road. Bass Lake on right. Some beautiful tall pines along here. Fish Hatchery rear entrance. Road turns left here. However turn to right pass the fish hatchery on left hand side. STOP. County Truck Highway “J.” Turn right. Pass Carrol Lake & Campground on left. Road is winding & lined both sides with maples. Stay in your own lane. BLUE ISLAND ROAD. Turn left. Two miles. Little Arbor Vitae Lake on left. Continue two miles to stop sign. Hwy. 70 East. Turn left on Hwy. 70 East and continue onto BIG ARBOR VITAE DR stay right (do not go onto Marsh View Rd) Big Arbor Vitae Lake on Right. Follow to Marsh View Dr turn right and continue to follow to Hwy 70 East. At 70 East turn right and follow to Highway 51 at stoplight take a left to Woodruff & Minocqua.